An inventory of a household’s goods provides an intimate glimpse of the owner’s life as no other document can. Reading it, one almost feels guilty of spying or trespassing. ELIZABETH AMSDEN (1724-1768), an unmarried woman from Deerfield, Massachusetts, made her living as a weaver; indeed she had a shop. Shortly before her death in 1768 she made a list of all her belongings and sold them to a townsman. 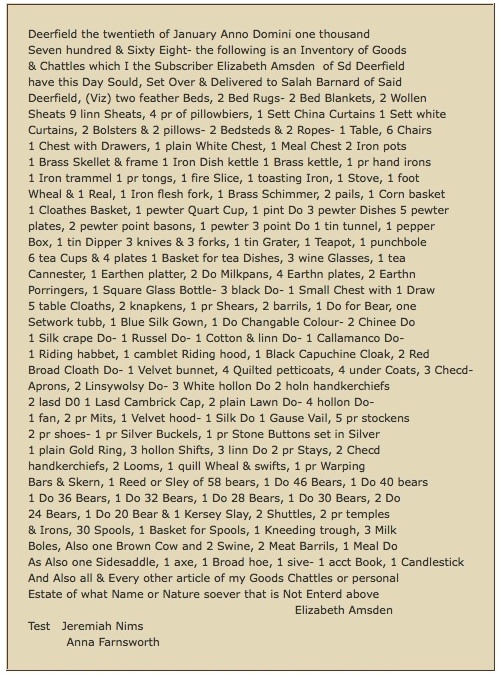 Here are her possessions, actually quite of number for a single lady. Note that “do” means “ditto”, “hollon” refers to a plain-weave fabric from Holland. Prominent are the tools of her trade: looms, warping bars, sley, shuttles. The signatures at the bottom left are those of the neighbors who witnessed the document. See the inventory in manuscript form HERE. Pocumtuck Valley Memorial Association, Deerfield MA. Washington had asked the help of Colonel James Clinton in finding a replacement for Mary, as he was “entirely destitute” of a housekeeper, and had heard good reports of Thompson. He hired her but she served for less than a year (July 1776 to April 1777) when she was let go because the spring campaign was about to begin. Apparently Martha Washington was upset when she learned that her husband had dismissed Thompson without consulting her and urged him to rehire her, if not for his military household then for Mount Vernon. Mrs. Thompson was located and agreed to return—to army headquarters at Morristown, New Jersey. Mrs. Thompson proved to be more than competent in discharging her many responsibilities—quite amazing considering that she could neither read nor write. When she retired in 1781 she was asked to “assist in the enquiries and examination” of a new cook. Washington preferred a German, “a Person that has an understanding in the business, who can order, as well as get a dinner; who can make dishes, and proportion them properly, to any Company which shall be named to him. . . .” Apparently someone satisfactory was found. When Mrs. Thompson left Washington’s employ, the General invited her to come and live at Mount Vernon but she was too infirm to make the trip. On October 10, 1783 John Trumbull, writing for Elizabeth Thompson, sent a letter to George Washington. When I had the favour of seeing your Excellency at Princeton you desired that I should make an Account for my Services in your Family to be laid before the Financier. I came in to Your Excellency’s Service as Houskeeper in the month of June 1776 with a Zealous Heart to do the best in my Power. Although my Abilities had not the Strength of my Inclinations Your goodness was pleased to approve and bear with me untill December 1781 when Age made it necessary for me to retire. Your Bounty and goodness in that time bestowed upon me the sum of £79 ..6..8 which makes it impossible for me to render an Account: my Service was never equal to what your Benevolence has thus rated them. And being now in my Eightieth Year should I ever want, which I hope will not be the Case, I will look up to Your Excellency for Assistance where I am sure I will not be disappointed. Thompson applied for and, in 1785, received a lifetime pension from the Continental Congress for her service: £100 a year. She died in 1788. Frank e. Grizzard, Jr. George! a Guide to All Things Washington (Mariner Companies, Inc., 2005), 305; see entry on Thompson HERE. See also the George Washington Papers at the Library of Congress, 1741-1799: Series 4. General Correspondence. 1697-1799; Elizabeth Thompson to George Washington, October 10, 1783. 373-74. For further information check the Mount Vernon SITE. Mary Palmer, born into a genteel family fallen on hard times, was about fourteen years old when she was hired for a year, in 1789, by Elbridge Gerry and his wife Ann to assist in tending their four-month-old baby. Gerry had been elected to the newly formed Congress, and Mary was to travel with the family from Boston to New York City, the nation’s capital. Now you must bear in mind that this was the darkest time in my father’s life. . . . He . . . was clerk in a store with a very small salary; my mother had an infant in her arms not a year old . . . and five other children besides myself and Joe, who was gone to sea. You will understand the idea of my going where I should be appreciated and introduced to some of the first people . . . we were all persuaded to think it was a fine thing. . . .
Aunt Kate came at the appointed time and took me and my little trunk to Cambridge, and left me. Mr. Gerry . . . received me with his wonted suavity and preceded me into a room and presented me to a handsome lady saying, ‘Here, wife, Miss Hunt has brought your little girl.’ She turned to me and said, ‘How do you do?’ with a pleasant smile, but coldly; turning to a young woman who seemed to be assisting her packing for the journey asked her to show me up to the nursery, and where to put my things. All this was so entirely different from what I expected that my heart sank within me. I saw I was considered a servant. . . . I had long known, that my father and Mr. Gerry had been intimate friends in the days of our prosperity, and foolishly expected to be received and treated like the child of an old friend in adversity. . . . I went with a heavy heart to the nursery, where was a woman with the baby in her lap, and a little four-year-old girl playing about the room with her doll. The woman spoke kindly to me . . . and soon asked me to take the baby, as she had a great deal to do, as the family went on Monday. This was Saturday. I could tend the baby; that was what I had done ever since I could remember anything, and took it. I could scarcely restrain my tears, I could not speak, but walked the room with my little charge, till Mrs. Gerry came and told me to go, with the young woman who entered with her, to the hall where their tea was ready and she would nurse the babe the while; I suspected this was the servants’ hall, and would not go, saying I did not wish for any tea. They urged me, but I persisted, and went supperless to bed that night. Oh, what would I not have given to be at home where I had always been loved and petted more than I deserved and here everyone looked cold and strange towards me; no doubt I behaved very badly and no one could like me. . . . The next morning I felt calmer, but dreadful homesick! Again I was told to go to the hall for breakfast. I went, and was surprised to see a large room with a long table set, surrounded by domestics of every age and appearance, only they were all white people. . . . The woman who had the baby, when I first went to the nursery, sat at the head of the table and presided over the coffee and tea, and a middle-aged man sat at the foot; these . . . were the housekeeper and steward, who were to take care of all things till master came back, and appeared decent people, but the rest were the most vulgar rude set I ever had seen, both in manners and language. I took a little breakfast, and left the table more heartsick than ever. The above passage can be found on pages 210-211 of In the Words of Women. The illustration of Elbridge Gerry is a detail of an oil painting by James Bogle, 1861, after a portrait by John Vanderlyn; it is in Independence National Historical Park, Philadelphia. 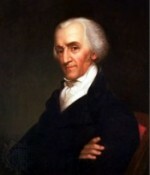 Gerry became the fifth vice president of the United States, serving under James Madison. Mary Palmer married Royall Tyler, a playwright and jurist, who was almost twenty years her senior. The couple had eleven children. In his youth Tyler was a womanizer and led a profligate life. He courted Nabby Adams but, pressured by her parents, she rejected him. Though the following letter is dated somewhat earlier than 1765, I found it interesting because it concerns the subject of indentured servants. A young woman, without monetary means, wishing to relocate to the American colonies, could finance her passage by agreeing with the ship’s captain that he could “sell” her on arrival in exchange for a term of service, generally seven years. This arrangement was called an indenture and was supposedly a legal contract with the “employer” providing food, clothing, and shelter. In 1756, Elizabeth Sprigs, a indentured servant in a Maryland household, wrote a letter to her father in London complaining of terrible treatment. Apparently she had left home under unpleasant circumstances but was reduced to begging for some assistance from her family. An indentured servant generally had little recourse if the arrangement proved unsatisfactory. In the South, indentured servants were being replaced by slaves. My being for ever banished from your sight, will I hope pardon the Boldness I now take of troubling you . . . my long silence has been purely owning to my undutifullness to you, and well knowing I had offended in the highest Degree, put a tie to my tongue and pen, for fear I should be extinct from your good Graces and add a further Trouble to you, but too well knowing your care and tenderness for me so long as I retain’d my Duty to you, induced me once again to endeavor if possible, to kindle up that flame again. Source: Elizabeth Sprigs, “Letter to Mr. John Sprigs in White Cross Street near Cripple Gate, London, September 22, 1756,” in Isabel Calder, ed., Colonial Captivities, Marches, and Journeys (New York: Macmillan Company, 1935).